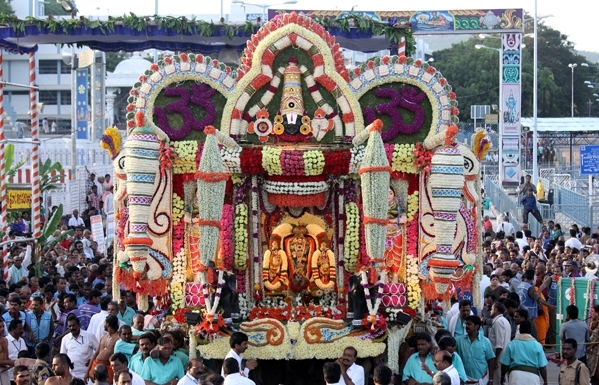 Tirumala Tirupati Devasthanams (TTD) performs the annual festival Anivara Asthanam in the hill shrine of Lord Venkateswara Swamy, Tirumala every year normally on July 16. This festival is one among the 450 festivals that is being performed to Sri Malayappa Swamy in Srivari Temple, Tirumala. 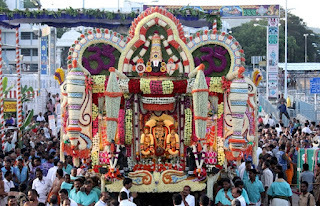 This year 2014, the Anivara Asthanam festival is going to celebrate on July 17, 2014 (Thursday). and are taken back to signify that the Lord Malayappa Swamy finds the officers fit enough to hold at their respective offices. New books will also be presented at the feet of the Lord for recording finances of the next financial year. The entire process is called ASTHANAM which will be performed in the Sanctum Sanctorum near Bangaru Vakili in the presence of Processional Deities of Lord Malayappa Swamy and his two consorts from 7:00am to 9:00am on July 17, 2014(Thursday). Pilgrims are not be allowed for this Anivara Asthanam festival. Pushpa Pallaki Seva: On the occasion of annual anivara asthanam, the presiding deity Sri Malayappa Swamy and his consorts Sridevi and Sri Bhudevi are taken out in procession on PUSHPA PALLAKI in the evening. It is a remarkable spectacle for devotees that Sri Malayappa Swamy and his consorts will be decorated with rich flowers and adorned with ornaments and garlands. Pilgrims will be allowed for the Pushpa Pallaki Seva. Note: During this festival all arjitha sevas will be cancelled except Suprabhata Seva . Pilgrims may kindly note the change.